Well, in truth I haven’t started selling anything yet. Not having heard anything from the council yet, plus the variability of the 2008 blend of cider and the need to actually get to the 2009 batch, I have been busy preparing the ground. So, last weekend I finally blended the 2009 cider – not before time as only have of it has been racked from its initial fermentation tanks. I am very pleased to say that its probably the most professionally made cider I have ever produced – a nice mixture of tannin and a little sharpness from the early apples which usually lack in body and make up for it in acid! However, this is not overpowering. Its also tasting a little yeasty, which is not really my preference but having bottled a bit I can see this dropping out fairly quickly so I am hopeful. Given my concerns over the 2008 blend, I decided to rack a percentage into the new blend – both to balance the acid more but also to deal with any problem of H2S. This is simply over production from the yeast and as the new blend is still finishing (one of the advantages of a natural fermentation is that its all still active) it should take care of things nicely. What has changed then? Most noticeably, the label! Having sat and stared at half a dozen b ottles with the label in situ for the last week, I came to the conclusion that it was misleading. The bubbles just make me think that it is a sparkling product... and what is the heart all about? It harks back to pre-company mucking about, when I had planne d to call my little enterprise ‘Love Cider’. This got itself ruled out in favour of 146 Cider, but I still liked the graphic. Ho hum! The label (mark 2) involved blocky type text (‘Earwig Factory’ for those who know about these things). As soon as the 4th person told me it looked like an alcopop advert, or something aimed at kids, I decided not to roll with that – although it was a simple design. So, we now have arrived at version 3 – one that I am particularly happy with. Its amazing what happens through the process of being unhappy with something, and subjecting ideas to the scrutiny of others!! Now all I have to do is to find a regular supplier, bottle my cider properly and sell it! Oh, and there are no prizes if anyone happens to spot that I have got the 'greater than' and 'less than' symbols the wrong way round on the label! This isn’t meant to be a ‘book on Herefordshire cider’, although there was so much to say about it it had to be split up to save any readers from boredom! However, having bought bottles from Westons, Greggs Pit, Once Upon a Tree and Lyne Down Cider I also wanted others that I hadn’t had time to visit (apologies to Tom Oliver!!!) 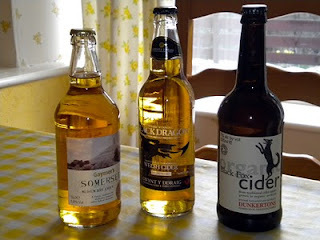 In order to get a full range, we bought some Gwynt y Ddraig and Dunkertons from a local Waitrose and found some others at Truffles Deli in Ross on Wye (a great place to buy Herefordshire cider, by the way!). I added a bottle of Gwatkins, Amazing Cider Company and Ross on Wye Cider Co to make up a decent representation. Come our final night, I figured I would get my friends to blind taste several ciders including my own. A bit ambitious, I figured that mine would stand a chance! So I opened 3 other bottles alongside one of mine and dished out the glasses. What a mistake! Mine had the aroma of egg and was really quite foul! I am not even sure why, as we had consumed two other bottles of mine which were fine (I am now doubting whether I can sell the 2008 vintage). This aside, the Dunkertons Black Fox unanimously came out on top of the 4 ciders we tried (Roaring Meg from Lyne Down came second, with the Gwent y Ddraig and Westons Extra Dry following up... mine was firmly last!) I have brought the others home to go through them at more leisure. Was there a lesson in all of this? I think there might be, coming from the visits this week. The 2008 cider was played around with – I back-blended another cider blend into my main blend once it had finished, which at the time I had hoped wouldn’t be a mistake. On the whole it hasn’t been. However, there have been several bottles with a eggy problem now, so I shall have to take a decision whether to bin it or keep it for personal use only. Don’t trust your Sat Nav to actually get you to the location! Allow several days to get round them – on average 2-3 a day is a max, especially if you intend to drive to them! Make sure you call ahead to ask permission to visit. Even using the ‘Cider Route’ guide, the odds are that a number of the cider makers are small and not always around (Greggs Pit is a good example). 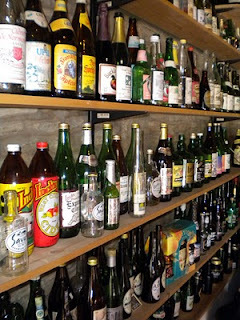 When I planned to visit a few, I was worried that these cider makers would be wary of a ‘hobbyist’ or ‘wannabe’ commercial producer visiting with lots of technical questions. Not so, I have to say that every cider maker I met in Herefordshire was welcoming, knowledgeable and really generous with their time. My last trip out was to meet two more artisan producers. 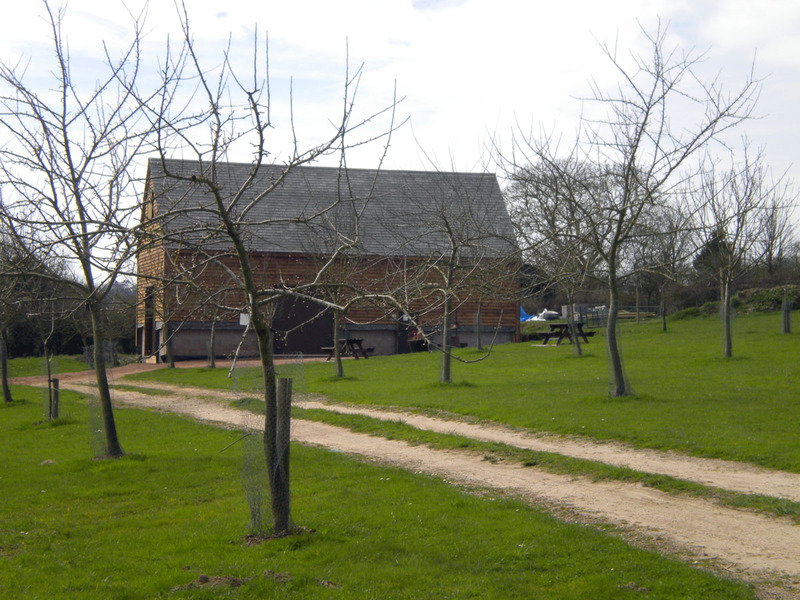 Once Upon a Tree are a relatively new artisan producer based in Putley. Whilst the chief cider maker, Simon Day, wasn’t available I met up with Norman who owns the farm and Dragon Orchard. 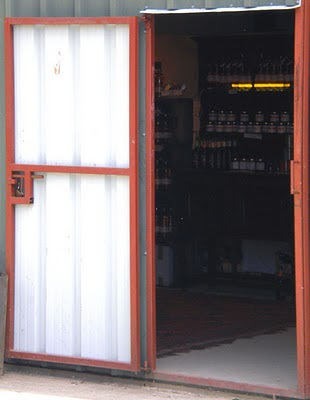 This time, I opted to be up front about my own cider making, and also about the Cider Workshop (after all, evangelising about the Workshop is never a chore to me!!). Norman was incredibly generous, showing me around and talking me through the way in which they craft their cider and perry. Craft is the right word to use, as they ferment each variety of apple and pear separately, only mixing them up at blending time.I loved the way that they present their cider in a similar fashion to wine – opting for 750ml wine bottles and still cider, I can wholly recommend it for its clean taste. Its definitely a cider with a purpose, seeming to know exactly what it wants to be and how it wants to taste. Sometimes, I feel my own cider cannot make up its mind and tries to taste like everything! So, another lesson learned. I probably get too many different varieties to separate them all. However, I can separate cider from desert much better – and I may well try this out next year. One other recommendation. Once Upon a Tree make a fantastic desert cider from Blenheim Orange apples. This is done by freezing the juice and only fermenting a third that thaws. A bit like apple jack in method, but the taste is incredibly sweet and smooth. And so on to my final destination, Lyne Down Cider. And another contrast. Whilst both Greggs Pit and Once Upon a Tree really try to craft cider to particular styles (and do well at it too), Lyne Down makes cider to sell – pure and simple, no fuss and very few frills. Mark, who owns Lyne Down, met me at the gate to his newly built cider house and ‘in progress’ shop and picnic area. I had a feeling it would be rather posh but Mark was very grounded and much more ‘business like’ about his cider business. His operation had more in common with New Forest Cider than the others I had seen locally – vats of cider (although there were single variety Stoke Red and another of Yarlington Mill. He also had the same stone bedded press as Greggs Pitt, although this is to be replaced something more hydraulic later this year. Mark was, once again, really open and helpful with his knowledge of cider craft. I now have a plan for racking cider that will take out a lot of fuss, bother and errant lees! He also had a couple of 1500 litre tanks for sale – which I can just see in my cider garage!! As all the others, the meeting ended with a tasting. This cider tasted a lot more like my own, albeit in a Western style that I do not go for. The blend contained many varieties of apple – not the few that the others used, and although this meant that there was less ‘impact’ of individual types of apple (others were very definitely sharp – although these ones usually contained a significant proportion of Browns Apple which is a full sharp cider apple). So, an enjoyable and educational trip... lets just see how this affects what I take to Putley in May!!! Easter holidays! Just back from a 5 day trip to the Forest of Dean with some friends. Not only did the weather hold out for us, it was a perfect ‘pre-Putley Cider Trials’ preparation... and it left me wanting to strive to make my cider as professional as possible! There was only time to visit 4-5 producers (this was a family holiday, after all! ), and we started with the surprising choice of Westons, and by contrast the much smaller operation of Greggs Pit. Both are found in Much Marcle – to some, the Mecca of Ciderland... in reality its a small place you could easily drive straight through on the bendy A449. 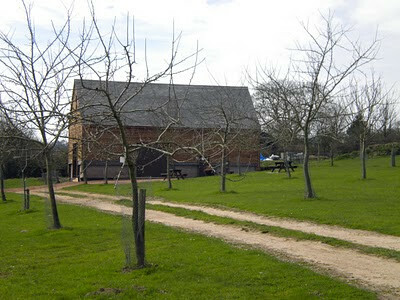 Westons provide a tourist attraction in itself, with farm animals, a playground, cafe and shop. 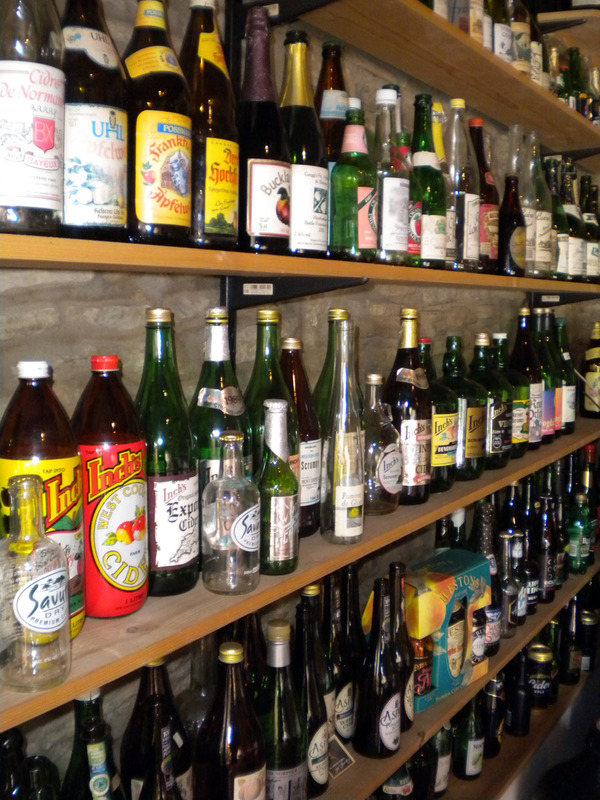 They even had a bottle museum (bottle collection is more accurate). Whilst the children cooed at the animals, I took my friend on the cider tour to see how things were done. Some may baulk at the idea of going round an industrial cider producer (I have never really been comfortable with the term ‘industrial’. In fact, you can see that the principles don’t change – apples must be collected, washed and milled, pressed and the juice must ferment. However, this could be hard to see, as the scale and methods are simply much larger and more, well, industrial. Although the topic of chapitalising never came up (and I promised myself not to be so provocative), there was no real effort to hide the fact – one of the guides at the tasting even said “it all starts at 11%”. However, on finding out that they produce more than 4 million gallons per year, with 15,000 tons of apples, the little animal in me had to do the maths on my Blackberry to work it out. Oh, and for those who like to be right about a producer like Westons, even a 75% yield of juice would only make 2.5 million gallons. Still, its horses for courses and you cannot argue that they aren’t good at what they do. At the tasting, whilst avoiding the ‘stock’ Stowford Press, the Vintage and Extra Dry were very pleasant. Going on to Greggs Pit (which had been arranged the day before), we found one of the owners, James Marsden, very welcoming. What it must be like to live with a view of an old pear orchard! 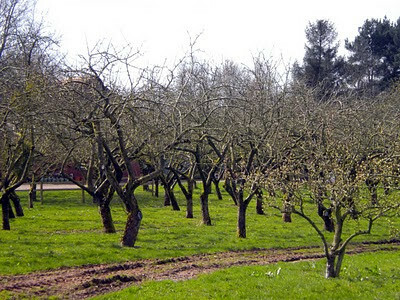 After showing us round the orchard, where the trees were almost ready to burst open with blossom, and the apple orchard to the rear of the house – 4-5 perfectly formed lines of standard fruit trees, we moved on to the production and storage area. My first thought was – this isn’t a whole lot bigger than the area I have for making and storing cider. However, any idea that this would be a like for like comparison vanished when I saw the stainless variable tanks and storage/bottling area. Most of Gregg’s Pitt’s cider and perry is produced by keeving (or, as James preferred, bouche method). This is something I have never tried before (although one of my fermentations naturally produced a cap of pectin – which leaves the juice with fewer nutrients for the yeast and therefore prolongs the fermentation). We tried several types of perry, including two seasons of the same blend. James was particularly enthusiastic about his perry. Unfortunately, my knowledge of perry is very limited, but it was incredibly light and fruity. I wanted to do the visit’s without coming across as a ‘cider bore’, mentioning the Cider Workshop - which I feared would lead me to be judged a ‘cider bore’, or mention that I am taking part in the Putley trials – which I feared may label me not only a ‘cider bore’ but also a philistine from Hampshire! Whilst I think I probably failed on all counts (after about 5 minutes at Greggs Pit I was handed a Putley Blossomtime Festival leaflet and announced I intended to take part), I made every effort to listen to the tips that Jams so freely gave me. I am not sure I have the budget for the stainless tanks, but I will make sure I try for slow fermentations with all my ciders in future!